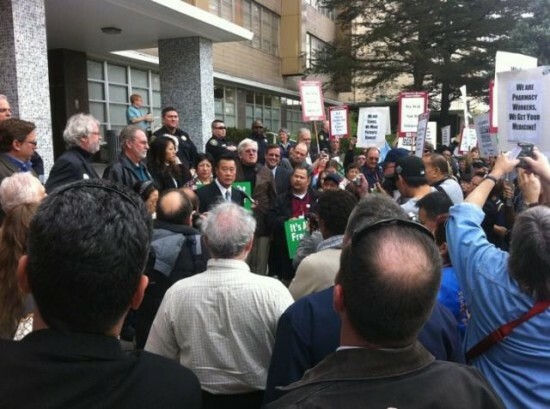 State Sen. Leland Yee speaks at a rally of UC workers. SACRAMENTO – State Sen. Leland Yee (D-San Francisco/San Mateo) on Dec. 3 officially introduced legislation that will prohibit executive pay hikes (using state or foundation funds) at the California State University or the University of California during bad budget years or when student fees increase. In 2009, Yee passed similar legislation to this session’s SB 8, but the bill was vetoed by Gov. Arnold Schwarzenegger. Gov. Jerry Brown has publicly stated that UC and CSU should resist pay hikes for their top administrators. Recently, the UC Regents approved a salary of over $486,000 for incoming UC Berkeley Chancellor Nicholas Dirks, which is a 10 percent increase from the current UC Berkeley chancellor. In addition, Dirks will be paid moving expenses, a more than $30,000 bonus, annual auto allowance, and a house on the Berkeley campus. Yee said that $50,000 of Dirks’ salary will be paid for using foundation dollars, which otherwise could go to student scholarships and other campus services. Yee has called on Dirks to follow the lead of incoming CSU Chancellor Timothy White, who refused to take a pay hike and reduced his salary by 10 percent. SB 8 will be considered in a Senate policy committee in early 2013.